Interesting thing is this. Whenever there have been times people didn't agree with President Obama, certain persons on facebook have made it very clear. With the relatively cheap gas prices, I haven't heard anyone talk about that on facebook, period. One big irony is that many persons I know are parents, and I would think they of all people would be very vocally happy about the dropping gas prices. Because obama and left wing kooks opposed every policy which is causing the price to fall, in particular, things like drill baby drill. So that's why production has exploded? One reason price of gas is down is because OPEC want's to slow the growth of American Shale oil, so they increased output. They want to keep their share of the market. I wonder if we could have helped cause a drop in gasoline prices if the federal government allowed for more oil exploration on federally owned lands? Off shore production is down because of shale and the Deep Water Horizon environmental disaster. Gas prices are lower than they have been in years. 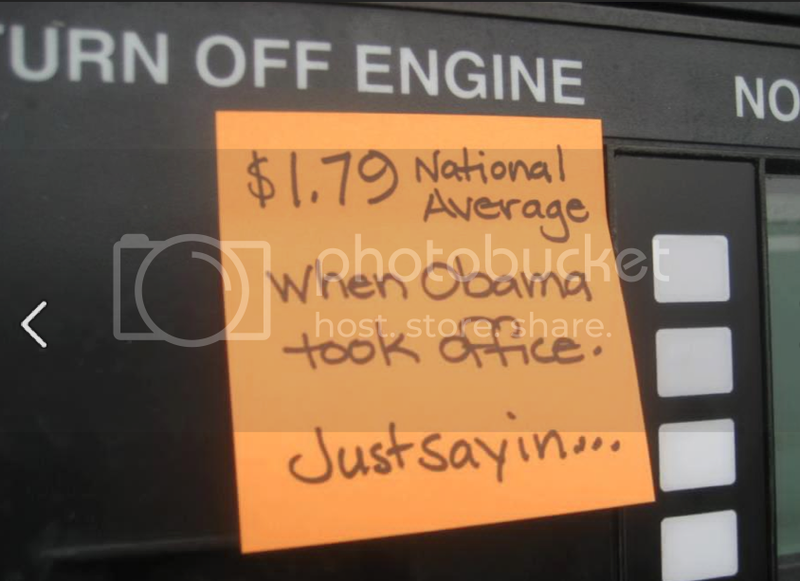 Being that Republicans credited Obama with the rise of gas prices, will they give him the credit he deserves? 2.05 today. Thanks, Mr. President! Much of the cost of gasoline/diesel is due to fed+state taxes....blame Congress or your state legislature for it not being even lower. Republicans never believed in the theory that the president has a secret dial under his desk by which he controls the price of oil. That is, and always has been, a Democratic hobby horse. I still remember winter of 2000-2001 after Bush was elected, gas prices were going up sharply. There were howls of 'Bush/Cheney done it.' Senate Dems led by Chuckie Schumer loudly called for an investigation into big oil. By the end of 2001, oil prices were going down, and gas was selling for under $1/gal in low tax states. Schumer quietly dropped the investigation. Analysts always will cite supply/demand. Democrats, as evidenced by 'Thanks Mr. President,' still hold to the secret dial theory. That brings up another point, too. In 2001 we had the tech bubble/crash and the 9/11 attacks, all of which yielded a weak economy. I think it's probably safe to say that falling oil prices usually go hand in hand with weak economic performance. So Democrats can save their shoulders, and stop patting themselves on the back over falling oil prices. Politicians are the kind of people who see a parade and rush to the front, acting like they are the leaders and responsible for the parade. Of course, when the parade changes direction on them, they do appear foolish as they try to rush to the forefront, once more. And so do their supporters. What is a bummer is that some posters on the right have entered the same lobotomy room and were sarcastically thanking Obama for the price of gas at 3.89 and now find themselves in a box now that the price is 2.29. As Gump would say " stupid is what stupid does"